"Poetry Pillow words" utamakura　歌枕, refers to place names used in Japanese poetry, where a kind of code with a special meaning, mood, expressing a season season or other reference to history is implied. Just mentioning YOSHINO will give the reader all the background of the Cherry Blossoms and Yoshitsune. They are similar to "makura kotoba" 枕詞, 枕言葉, "pillow words", normal words used as codes to bring out a mood or mental scene for the reader. We also have "kakekotoba"　掛詞", a kind of pun word that have more than one meaning and may add a funny or serious twist to a poem. Often wrongly translated as "pivot word", see below. Often situated in rural parts of Japan, where haikai poets lived a free life. They are not part of the classical canon of Waka Utamakura, but became quite popular with the growing number of haikai poets.
. WKD : Places visited by Matsuo Basho 松尾芭蕉 . A central feature of traditional Japanese poetry (waka) is the use of utamakura— a category of poetic words, many of which are place-names or the names of features associated with them—to cultivate allusion and intertextuality between individual poems and within the tradition. 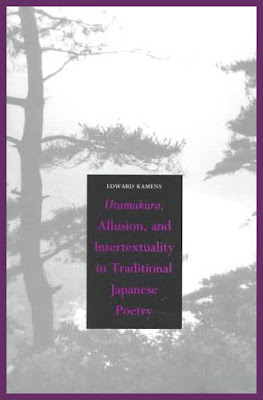 In this book Edward Kamens analyzes a wide selection of poems to show how utamakura came to wield special powers within Japanese poetry. He reveals how poets in generation after generation returned, either in person or in imagination, to these places and to poems about them to encounter again the forms, styles, and techniques of their forebears, and to discover ways to create new poems of their own. Kamens focuses especially on one figure, "the buried tree," which refers to fossilized wood associated in particular with an utamakura site, the Natori River, and is mentioned in poems that first appear in anthologies in the early tenth century. The figure surfaces again at many points in the history of traditional Japanese poetry, as do the buried trees themselves in the shallow waters that otherwise conceal them. After explaining and discussing the literary history of the concept of utamakura, Kamens traces the allusive and intertextual development of the figure of the buried tree and the use of the place-name Natorigawa in waka poetry through the late nineteenth century. He investigates the relation between utamakura and the collecting of fetishes and curios associated with utamakura sites by waka connoisseurs. And he analyzes in detail the use of utamakura and their pictorial representations in a political and religious program in an architectural setting—the Saishoshitennoin program of 1207.
bussokusekika 仏足石歌 "Buddha footprint poem"
in Japanese poetry have a function similar to the seasonal word. Each famous place in Japanese poetry had a core of poetic associations on which the poet was obliged to compose. These famous poetic places provided an opportunity to commune across time with earlier poets. Like seasonal words, famous places functioned as a direct pipeline to the communal poetic body. By contrast, there are very few, if any places, in North America that have a core of established poetic associations of the kind found in famous places in Japan. And accordingly there are relatively few English haiku on noted places. Utamakura (literally "poem pillow") is a rhetorical concept in Japanese poetry. Utamakura is a category of poetic words, often involving place names, that allow for greater allusions and intertextuality across Japanese poems. places that trigger a separate mental association through a pun. Utamakura serve as a significant tool to achieve yugen (mystery and depth) in Japanese poetry by adding profundity and indirect beauty in poems. Also, it can be used as a source for identifying significant figures and places in ancient Japan. Utamakura enables poets to express ideas and themes concisely and thus allowing them to stay within the confines of strict waka structures. Some scholars see the use of geographical allusion as the evidence for a restricted scope of poetry writing. Although the poets' "true" meaning was true because the essence was initially pre-established, the poems were written within fixed topics (daiei). The poet could inhabit a subjective position or persona and write about the topic, but not necessarily about his/her personal feelings. Utamakura could have suppressed poets' individuality or creativity. The history of utamakura is found in documents on the study of poetry such as the Utamakura of Noin, by the poet and monk of the late Heian period, and lists of places in the Utamakura Nayose 『歌枕名寄（うたまくらなよせ）』 (Utamakura reference book). Utamakura were first used by traveling priests. These priests collected stories from the different towns they traveled to. Since they traveled many places, it was easier to remember the details of a story by using a single, consistent reference point for each recurring type of event that occurred in their tales. Over time, the people across the Japan came to identify utamakura place names by the psychological feelings associated with the references made by the wandering priests. After utamakura place names and people had become well established, eager waka poets went sightseeing to the sites of utamakura. Beyond becoming familiar with the actual scenery of the poems, entering the locale of a poem or story deepened one's understanding of it. Utamakura was also used in renga, a form of Japanese collaborative poetry that is an ancestor of haiku poetry. In renga, the first phrase should contain a season word (kigo) to each hokku (a verse in the standard renga form of three verses with 5-7-5 syllables), but Matsuo Bashō stated if an Utamakura comes up into a hokku, then no seasonal term must appear to avoid complicating the imagery of the poem. Utamakura can be described as "descriptive epithets" or "circumlocutions designating geographical sites" in poetry of other languages that conjure a memory, thought,image or association with the place referred to. nakajima　中島 island in a lake, "Island of Eternity"
. 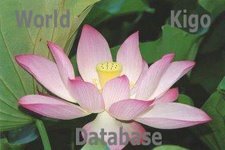 Gokuraku　極楽　- The Buddhist Paradise .
. ikebana 生け花 Auspicious Flower Arrangement . suhamadai, suhama-dai 州浜台 "beach stand"
shimadai, shima-dai 島台 "portable island"
Because of the general tendency in the West to try to replicate the Japanese use of kigo (season words) our haiku are easily misinterpreted as 'a poetry of nature'. hai-makura - places that are lifted into that aura by their mention in a well-known poem. "What can I do with an old tree? Why don't you plant it in Not-Even-Anything Village, or the field of Broad-and-Boundless, relax and do nothing by its side, or lie down for a free and easy sleep under it? Axes will never shorten its life, nothing can ever harm it. If there's no use for it, how can it come to grief or pain?" The makurakotoba are commonly found in other languages under the category of “epithet”. The Four Seasons in Love: From Kokinshū to Modern Haiku. Waitinglist. A long ABC index. rhetorical devices used in Japanese poetry 31-syllable, Waka (poetry). Lit. hanging words. word play, pun. pivot or bridge betweentwo images.
. chihayaburu 千早振る the divine in Kumano . This is an old makurakotoba for the old capital of Nara. Here is my LIST of Japanese place names! Saijiki of Events, Rituals, Festivals and Ceremonies in Japan. "The Island of the Dragonfly"
Amanohashidate, Ama no Hashidate "Bridge of Heaven"
. Edo 江戸 famous places of Edo - LIST . Ginkakuji - Temple. Ginkaku-Ji 銀閣寺. Bridge. 賀茂大橋 (Kamo Oohashi) Kyoto. Town at Lake Biwa. One of the eight Omi Hakkei famous landscapes. Kofuku-Ji, Koofukuji - Kigo. Temple in Nara. Kokubunji, Temple Kokubun-Ji - There are quite a few all over Japan. Kyoto . . . Hana no Miyako, "Capital of Flowers"
KIGO. also "coming back from Matsumae" and "Matsumae sushi"
Saga prefecture. The deity Kishibojin is venerated here. Nara and its Rice Gruel Tea Song ..
Obasuteyama, Sarashinayama, Kamurikiyama - Nagano. Osaka, Yodo, O-Yodo (old names) Town. Saihoji, Saihoo-Ji. "Temple in the Western Direction"
Treasure house at the Temple Todaiji in Nara. Shrine names of Japan. - Festival Saijiki. Tago no Ura Bay - Suruga Bay, Shizuoka. Temple Names of Japan - Festival Saijiki. Toji, Temple Too-Ji in Kyoto (Tooji), "Eastern Temple"
Yuigahama beach at Kamakura - "beach at Yui"
Here is my LIST of place names!